Full list of authors includes Paul Witcover, Delia Sherman, and Rachline Maltese. 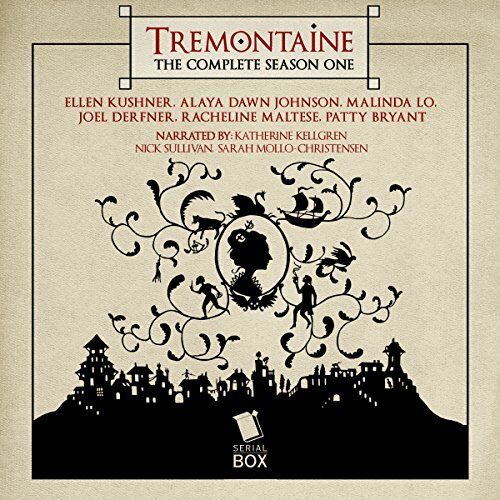 As a long-time Swordpoint fan with a beastly commute, I was incredibly excited to see the facinating Tremontaine serial novel appear as an audio book. For the last two weeks I've happily listened to the exploits of Kaab, Micah, Rafe and of course, Diane, Duchess Tremontaine, as I inch my way to and from work. The story is engrossing and the narration mostly fantastic. Mostly. Narration is shared by Katharine Kellgren, voicing Diana's POV sections, Sarah Mollo-Christensen, voicing Kaab and Micah, and Nick Sullivan, voicing Rafe and occasionally other male POV characters. Kellgren and Mollo-Christensen are both amazing - Kellgren gives an arch, bombastic feel to Diane, her voice dripping acid when Diane is displeased and rising in hysteria when Diane remembers her tragic past. Mollo-Christensen demonstrates the greatest range, showing Kaab light and playful with her friends and still and calm as a jaguar when under attack. She gives Micah the voice of an blunt, earnest, sweet, and above all YOUNG genius. Micah is codedly autistic, Kaab is a foreign noble, and Kaab's lady-love Tess is a Riversider through and through. Each required careful narration, and Mollo-Christensen knocked it out of the park. And then there's Nick Sullivan. Nick Sullivan is a prolific narrator, and I'm sure that there are roles that he's well suited for. This story wasn't it. Sullivan fails to inject the smallest amount of emotion into his reading, which means that listener perspective suffers. For example, at one point near the end, Rafe attempts to prostitute himself in order to save his beloved. Reading the actual text makes it clear that Rafe is sad and frantic and desperate. Sullivan sounds like he's reading Cialis ad copy. Sullivan also gives slightly insulting readings for our female POCs. He gives Micah a flat, nearly robotic voice. He chooses an over-the-top accent for Kaab that doesn't remotely match Mollo-Christensen's, and annoyingly, he mispronounced many Kinwiinik names. His reading for Diane sounds like Mrs. Doubtfire. Part of this may be a function of the production process, as I'm sure the narrators aren't doing table readings or anything. Still, it took me out of the story at first, and his voice never got less jarring. By the end, I gritted my teeth through Sullivan's narration. In general, I loved the story. And I loved two-thirds of the reading team. Whether the last third is a deal breaker for other listeners, I don't know. so easy to visualize this super fun story- accents across the 3 narrators were unsatisfying in a few chapters (hence the 4stars for performance). Amazing. I loved it. The best audio book I've ever purchased by an order of magnitude.